Guest Blogger Nell entertains childhood dinosaur dreams on her visit to The Holiday Shops. Sounds like she'll be first in line to visit the new Field Station Dinosaurs park this spring. Some people grew up liking dogs, others preferred cats, I on the other hand favored dinosaurs. Therefore, I was super excited to find a new kiosk in Bryant Park this year called Field Station: Dinosaurs. 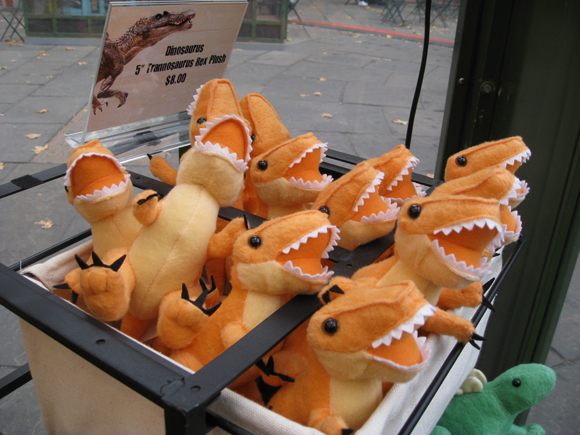 The kiosk has a variety of dinosaur gifts that would make any small child (or grown woman) smile on Christmas morning. 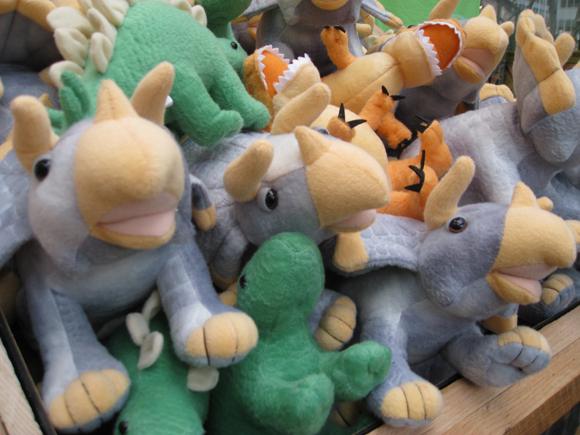 For $8 - $12 you can purchase a plush dinosaur of the stegosaurus, triceratops, or tyrannosaurus rex species. 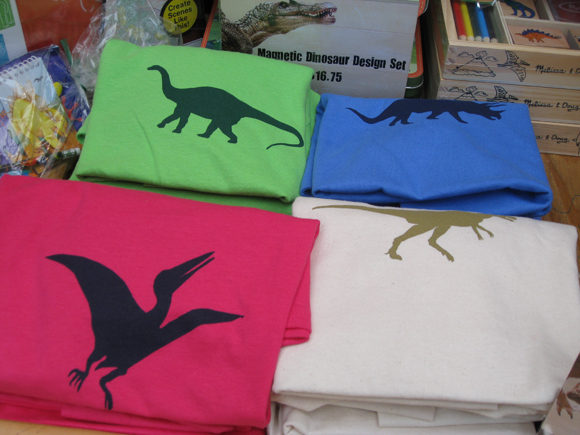 They have colorful t-shirts printed with dinosaur silhouettes that come in youth sizes XS – L for $13.75 each. Maybe I could squeeze into a size Large. 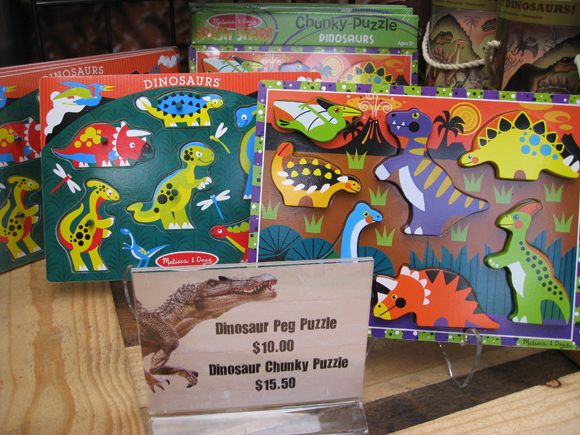 There are also chunky and peg style dinosaur puzzles for the little kids and more challenging 63 piece puzzles for the older kids. The puzzles range in price from $10 - $15.50. What makes this kiosk even more exciting is that it is being run by the producers of a new outdoor dinosaur exhibition that will be opening in Secaucus, New Jersey in May 2012. The exhibit will include thirty-one full-sized animatronic animals, daily workshops, and interactive demonstrations for kids of all ages. The Field Station: Dinosaurs website will launch on December 4th, and while you’re anxiously waiting for the Jurassic theme park to open next spring, come by Bryant Park and pick-up some adorable dinosaur gifts for all of those dino-lovers in your lives. *Look for special extended hours during the holidays. Some shops may be open on Christmas Day.